Make Halloween decorating easier this year with our Halloween Decorating Kits! Don't let your room go bare for Halloween! Decorate your home, school, or office with our variety of kits. Decorating Kits are a great way to bring the holiday spirit to a space without having to put a lot of effort or time into it. Purchase one of these kits and quickly decorate any space. The Halloween Decorating Kits vary from tissue decorations to cut outs. We also have some Kits with a mixture of both. Everyone will love the decorations inside and when they find out how easy it is, they will want a decorating kit for their own home or office space. 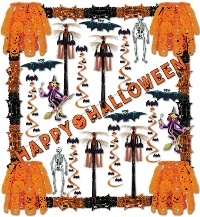 Check out our popular Halloween Trimorama for easy decorations. If you need more decorations check out our other Halloween decorations. You can easily find decorations and accessories that will perfectly match the contents in this decoration kits. Hope you have a BOOtiful Halloween! It's Fun to Decorate for Halloween! Halloween is observed all over the world. Children and adults alike dress up in funny or scary costumes, throw parties, go trick-or-treating, and participate in parades. You'll want to be ready for Halloween this year with our fun and colorful Halloween decorating kits. Each kit comes with different items like cutouts, garlands, hanging decorations, banners, and streamers. You'll want to take a moment to see which kit will suit your Halloween needs for your home or office. For instance, the Halloween Decorama is great for decorating a classroom or office, while the Halloween Reflections Decorating Kit will fill a large room and the Ultimate Halloween Outdoor Decorating Kit will cover your entire front porch. No matter which decorating kit you choose, anyone who walks past your home or comes over for a Halloween party will be impressed with everything you used in these awesome decorating kits.